Don’t want to be a holiday zombie? Want to avoid the crawl from store to store, looking for gifts that are sure to bore? I recommend shopping online for amusing things to tuck beneath that tree you killed for Christmas … like zombie books and toys! So here’s a short sampling of holiday treats for all the good ghouls and boys (with links). 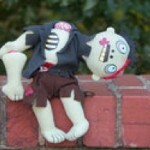 Zombie stuff from the big A (Amazon): LEGO zombies, zombie finger puppets, etc. From B (bacon) to Z (zombie snack bibs) and everything bacon and zombie in between. Gore-geous Gothic garb and housewares. Killer accessories from the Krafty Kreep. 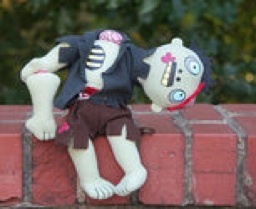 Rob, Toxic, Boo, Muck, Stitch … zombie cuddle toys for little girls and boys from Zombie Zoo. Zombie action figures (watch out!). What a fun post! Great tips and suggestions for this gift-giving season. Thanks for the tips.